Before I dive into my review, I wanted to say upfront that I had never before experienced Octodad in any capacity before playing my review copy and to say I was a bit skeptical would be a gross understatement. 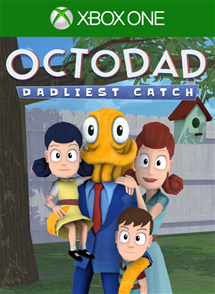 Octodad is described by Young Horses as a third-person puzzle / action game and a sequel to the first Octodad game which only appeared on PC. You play the role of an Octopus, living the life of a human trying to keep his true identity a secret from his wife and kids. As the song from the game suggests…nobody suspects a thing. 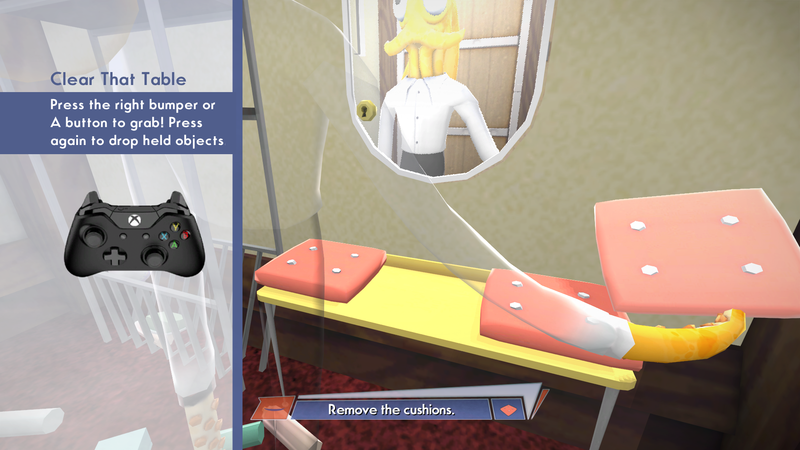 On the Xbox One version of Octodad: Dadliest Catch you have the choice of single player and co-op. When playing co-op you can assign different limbs of Octodad to different controls making it a truly co-op experience. I wasn’t able to spend too much time playing in co-op but from the time I did play it was a blast! Right off the bat you are given a thorough yet swift tutorial on the mechanics and controls of the game. There isn’t really much to the controls but to begin with they are infuriating. You lift your ‘legs’ with the trigger buttons, move your ‘arms’ up, down, left and right with the right stick and the left stick controls both arms and legs depending on what you are currently moving around. It may sound a little confusing and at first it will be. There was countless times I had the urge to throw my controller across the room and just quit, especially whilst trying to throw something. As you progress through the game the controls suddenly clicked for me and I was controlling Octodads extremities as if they were a part of my own body. Places that seemed out of reach before became easily accessible once I got used to the controls and I have to say the frustration levels were very low after the first 30 minutes. Where did I leave that key? Octodad is split up into 12 story levels, along with 3 extra levels each with varying every day tasks you must perform without rousing suspicion. These activities range from getting married at the alter, to mowing the lawn and going shopping with your family. I know this may sound a bit tedious and dull, but the way in which Octodad moves makes even drinking a cup of coffee a welcoming challenge. Throughout the story I found my self giggling at the characters reactions to some of the things I was doing. It may not sound like much, but I don’t generally laugh out loud at games. 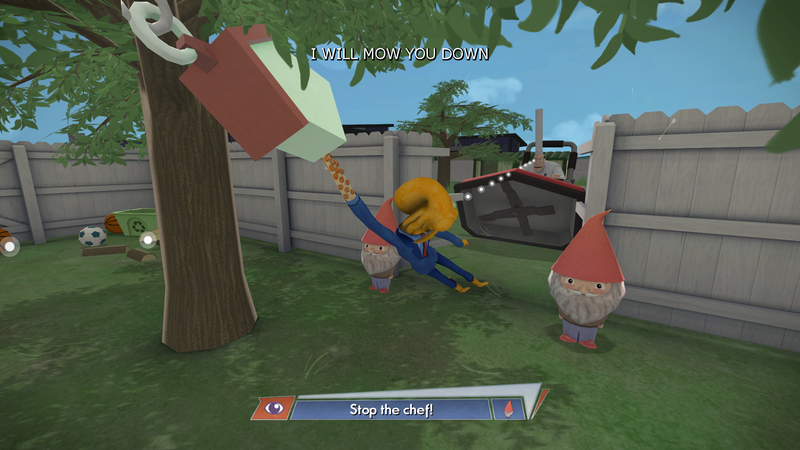 Octodad even has a nemesis in the form of a chef that can see through your disguises. Throughout the game the chef will try his utmost to expose who you are. If people realise you are in fact an Octopus, then it is game over, so you need to be savvy when doing certain tasks so you don’t rouse too much suspicion, especially around Marine Biologists because they can see right through your disguises. Now onto the achievements. Octodad provides plenty of variety on this front. The majority of them are for doing certain tasks throughout the levels, such as throwing five fish into the sea, or throwing the ring on Scarlett’s finger at the wedding. You also get an achievement for finishing the game without dying and collecting all ties (3 per level). Overall, I enjoyed my time grabbing all the achievements in Octodad and it they aren’t as difficult as they first sound. All in all Octadad is a fun, upbeat game that makes generic tasks fun and enjoyable. Pair that with the catchy soundtrack and you will find yourself playing it with a smile. There are times when the game will rub you up the wrong way with the physics of Octodad, but that slight frustration is worth enduring for the sheer fun factor. My original skepticism was completely misplaced and I am really glad I gave Octodad the time of day. 2) Co-op is a blast!